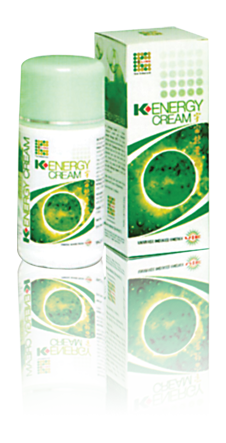 K-Energy Cream is made from natural resources. This product was developed by scientists to treat various types of skin problems. It is suitable for all skin types and contributes energy and oxygen while providing transformation and balancing of the skin. This power cream is excellent for firming the face and body which help to produce a radiant and youthful look. It also nourishes the skin, slims the body, eliminates pain, odor, athlete's foot and others. a complete skin treatment compromising of treating blemish skin, moisturizing, nourishing as well as replacing dead skin cells. K-Energy Cream enables the skin to become clean and radiant naturally. before performing exercises, use K-Energy Cream on muscle areas to prevent muscle tear. Apply K-Energy Cream directly onto affected part of the skin at least twice a day.